Today I want to talk about running styles, or the "athletic aesthetic". A well trained and passionate runner is very easy to detect: slim, elegant, self-assured, as the man in red trousers on the picture above. What about the other guy on the left? Well, if you think he's Rowan Atkinson aka Mr. Bean you are mistaken: he's no less than the Italian Prime Minister himself, mr Renzi! The man is obsessed with the idea of constantly promoting his country wherever he goes. 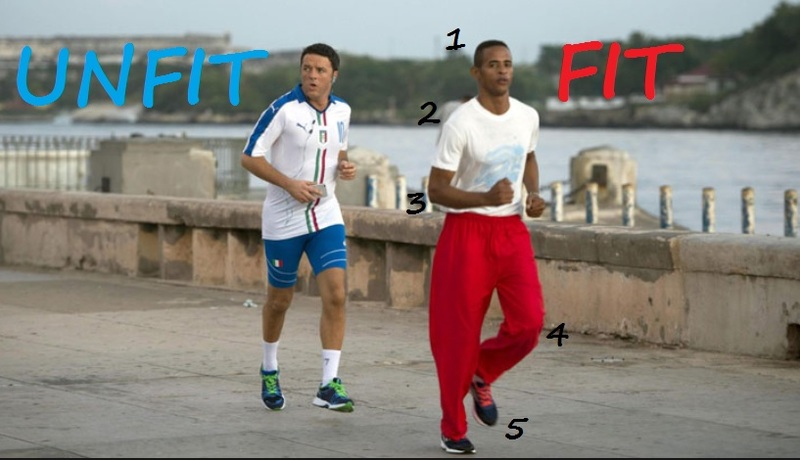 So here he is, running in Havana, in occasion of a business visit to Cuba, sporting a green-white-red (Italy flag colors) and blue outfit and accompanied by an athletic bodyguard. Look at the man on the right: his neck is straight, he's looking into the horizon. The man on the left looks like he's going to attend to his dog's funeral. The position of head, neck and most of all shoulders says a lot about our anaerobic threshold, stamina and resistance to fatigue. In the picture above, the Italian PM seems to be running on empty. While running, many inexperienced runners keep their elbow in an inefficient position, that might cause energy consumption or more fatigue. The man on the right is a perfect example of an optimal arm running position. Whereas the man on the left is apparently crawling and his legs seem to be quite rigid, the real runner on the left is bending both his knees and ankles, sign of flexibility and elasticity. He looks much more tonic and reactive than his running partner.